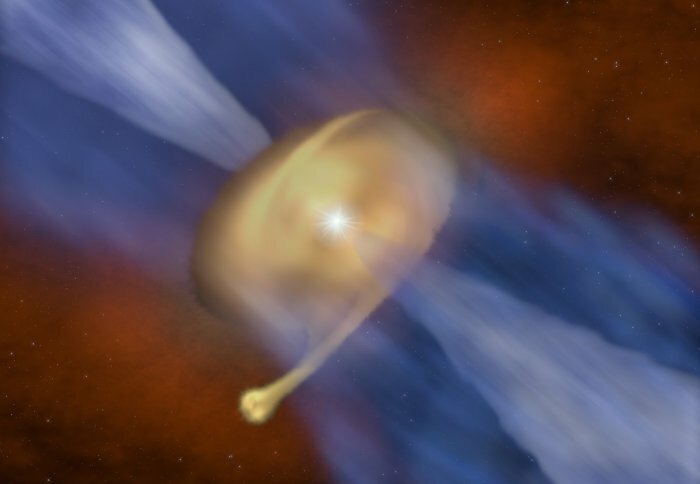 Astronomers were observing the formation of a massive young star, called MM 1a, when they discovered an unexpected object nearby. MM 1a is surrounded by rotating disc of gas and dust. But orbiting just beyond this disc, they discovered a faint object they called MM 1b, which they discovered was a smaller star. MM 1b is believed to have formed out of the gas and dust surrounding the larger MM 1a. The team of astronomers, led by the University of Leeds and including an Imperial College London researcher, have published their discovery today in the journal Astrophysical Journal Letters. Co-author Dr Thomas Haworth, from the Department of Physics at Imperial, helped predict what might be observed around MM 1a, and then to interpret what they actually found. He said: “It’s great when the new data surprises you, which was definitely the case here. Stars form within large clouds of gas and dust in interstellar space. When these clouds collapse under gravity, they begin to rotate faster, forming a disc around them. It is in these discs that planets can form around low mass stars like our Sun. By measuring the amount of radiation emitted by the dust and subtle shifts in the frequency of light emitted by the gas, the researchers were able to calculate the mass of MM 1a and MM 1b. They found that MM 1a weighs 40 times the mass of our Sun. The smaller orbiting star MM 1b was calculated to weigh less than half the mass of our Sun. Observation of the dust emission (green) and hot gas rotating in the disc around MM 1a (red is receding gas, blue is approaching gas). MM 1b is seen the lower left. Credit: J. D. Ilee / University of Leeds. The team believe stars like MM 1b could form in the outer regions of cold, massive discs. These discs are unable to hold themselves up against the pull of their own gravity, collapsing into one or more fragments. The team believe their discovery is one of the first examples of a ‘fragmented’ disc to be detected around a massive young star. The researchers note that newly discovered young star MM 1b could also be surrounded by its own disc, which may have the potential to form planets of its own – but it will need to be quick. The astronomers made this surprising discovery by using a unique new instrument situated high in the Chilean desert – the Atacama Large Millimetre/submillimetre Array (ALMA). Funders for this research include the Science and Technologies Facilities Council (UK) and the European Research Council. Simulation of groups of positrons being concentrated into a beam and accelerated. No image credit . The new method could be used to probe more mysteries of physics, like the properties of the Higgs boson and the nature of dark matter and dark energy, and provide more sensitive testing of aircraft and computer chips. The method has been modelled using the properties of existing lasers, with experiments planned soon. If proven, the technology could allow many more labs around the world to conduct antimatter acceleration experiments. Particle accelerators in facilities such as the Large Hadron Collider (LHC) in CERN and the Linac Coherent Light Source (LCLS) at Stanford University in the United States, speed up elementary particles like protons and electrons. These accelerated particles can be smashed together, as in the LHC, to produce particles that are more elementary, like the Higgs boson, which gives all other particles mass. They can also be used to generate x-ray laser light, such as in the LCLS, which is used to image extremely fast and small process, like photosynthesis. However, to get to these high speeds, the accelerators need to use equipment that is at least two kilometres long. Previously, researchers at Imperial College London had invented a system that could accelerate electrons using equipment only meters long. Now a researcher at Imperial has invented a method of accelerating the antimatter version of electrons – called positrons – in a system that would be just centimetres long. The accelerator would require a type of laser system that currently covers around 25 square metres, but that is already present in many physics labs. “The technologies used in facilities like the Large Hadron Collider or the Linac Coherent Light Source have not undergone significant advances since their invention in the 1950s [not true, HL-LHC and LCLS II are on the way] . They are expensive to run, and it may be that we will soon have all we can get out of them [not true]. While the method is currently undergoing experimental validation, Dr Sahai is confident it will be possible to produce a working prototype within a couple of years, based on the Department’s previous experience creating electron beams using a similar method. The method uses lasers and plasma – a gas of charged particles – to produce, concentrate positrons and accelerate them to create a beam. This centimetre-scale accelerator could use existing lasers to accelerate positron beams with tens of millions of particles to the same energy as reached over two kilometres at the Stanford accelerator. Colliding electron and positron beams could have implications in fundamental physics. For example, they could create a higher rate of Higgs bosons than the LHC can, allowing physicists to better study its properties. They could also be used to look for new particles thought to exist in a theory called ‘supersymmetry’, which would fill in some gaps in the Standard Model of particle physics. The positron beams would also have practical applications. Currently, when checking for faults and fracture risks in materials such as aircraft bodies, engine blades and computer chips, x-rays or electron beams are used. Positrons interact in a different way with these materials than x-rays and electrons, providing another dimension to the quality control process. A space mission to test how objects fall in a vacuum has released its first results, providing an improved foundation for Einstein’s famous theory. The mission’s principle investigator, Pierre Touboul from France’s national aerospace research centre, ONERA, said: “The satellite’s performance is far exceeding expectations. Data from more than 1,900 additional orbits are already available and more are to come. Plant-eating critters are key to helping ecosystems survive global warming, offering some hope for a defence strategy against climate change. An international research team created miniature marine ecosystems and tested how they fared in warmer conditions. They found that in the hottest conditions, ecosystems that included limpets – voracious snail-like marine herbivores – fared the best. The study, published in Science Advances, monitored mini ecosystems on rocky shores made up of different collections of organisms. The ecosystems were grown on special hard plastic plates that could be individually warmed. This allowed the researchers to test how the different ecosystems responded to temperature rises while in their natural habitat. Ecosystems are in a delicate balance: removing organisms that do key jobs can cause the whole system to deteriorate. If this ecosystem is then put under stress, it is less able to cope and can collapse. In these experiments, it was the key job performed by the main herbivore (limpets) that helped the ecosystems stay resilient in the face of warming. Limpets are voracious consumers of algae, and their action prevents algae from building up and using all the available space – a valuable resource on rocky shores. Lead author of the study Dr Rebecca Kordas, who completed this research for her PhD at the University of British Columbia and is now a research fellow at Imperial College London, said: “The herbivores created space for other plants and animals to move in and we saw much more diversity and variety in these ecosystems. The research team studied life in the intertidal zone, the area of the shore between the low tide and high tide, on the coast of British Columbia. This area is home to a community of starfish, anemones, mussels, barnacles and seaweed. As the tide moves in and out, the plants and animals must cope with huge variation in temperature every day, sometimes as much as 20 to 25 degrees Celsius. Despite dealing daily with these extremes, the ecosystems can be severely damaged by further warming. Dr Kordas said: “When heat waves come through British Columbia and the Pacific Northwest, we see mass mortality of numerous intertidal species. Senior study author Professor Christopher Harley from the University of British Columbia says that, in general – consumers like limpets, sea otters or starfish are very important to maintaining biodiversity, especially in aquatic ecosystems. Losing these species can destabilize ecosystems, but protecting them can make ecosystems more resilient. “We should be thinking of ways to reduce our negative effects on the natural environment and these results show that if we do basic conservation and management, it can make a big difference in terms of how ecosystems will weather climate change,” Professor Harley said. Fusion energy just got one step closer. Researchers have at last been able to model the behaviour of electrons under extreme densities and temperatures, similar to those found inside stars and planets. Although electrons are ubiquitous in our universe, carrying electrical current and determining the physical properties of materials, physicists have never before been able to describe the ways large numbers of electrons behave together- especially at high densities and temperatures. This new research [Physical Review Letters] could shed light on the how matter behaves in fusion experiments, in turn leading to a new source of clean fusion energy. Although it is easy enough to describe the large-scale behaviours of electrons- such as how electrical current, resistance, and voltage work- quantum forces control the behaviours of electrons at the microscopic level, causing them to act like a quantum mechanical gas. 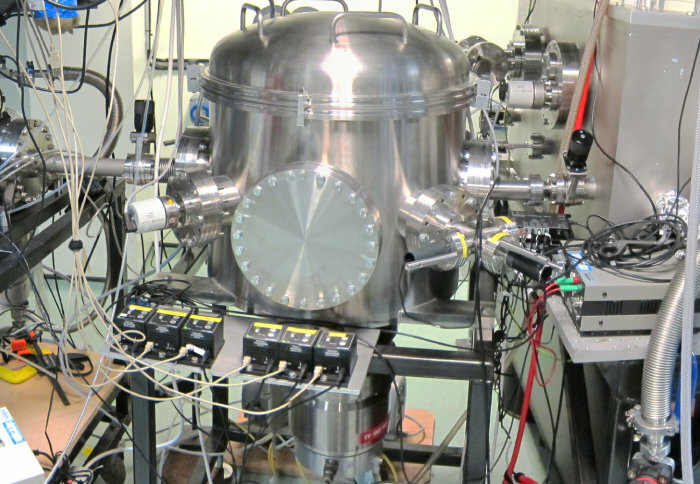 Until the success of this research, scientists were only able to create simulations that described the behaviour of this electron gas at very low temperatures. However, the centres of planets like Earth and stars are filled with warm, dense matter – matter that is also critical to fusion experiments. 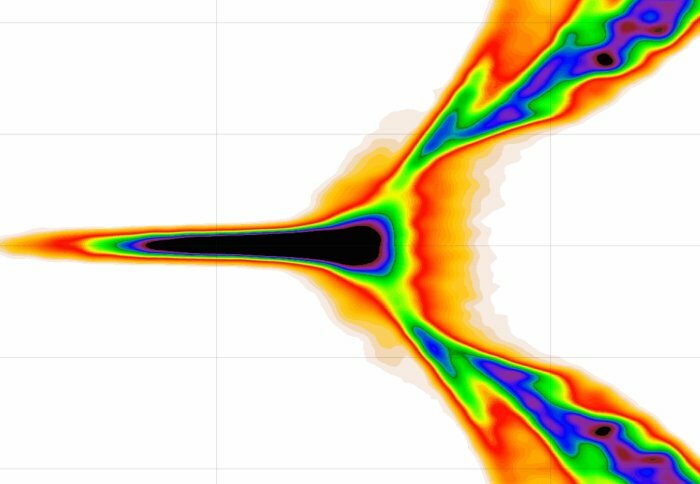 With the help of computer simulations, the new work solves the equations that describe the electron gas precisely. The team has thus completely described the thermodynamic properties of interacting electrons in warm dense matter for the first time. Imperial and one of Japan’s top universities joined forces at a two-day workshop in London this week. The 2nd Tokyo Tech-Imperial Workshop, brought together some of the world’s leading researchers to explore new collaborations in bioscience and its links with technology, encompassing expertise in synthetic biology, data science and neurotechnology. “Although this is about promoting new collaborations, the two universities are old friends,” he said. Professor Rod Smith, who has been collaborating with Tokyo Tech engineers since the 1970s, emphasised the very long-term nature of London and Imperial’s connections with Japan, dating back to the 19th century. These ties include the father of seismology John Milne (1850 – 1913) who, after graduating from the Royal School of Mines, made some of his most important discoveries at Tokyo’s Imperial College of Engineering. Professor Maggie Dallman, Associate Provost (Academic Partnerships), was the driving force behind the Tokyo Tech-Imperial workshop series, the first of which was held in Japan in 2016. London correspondents from the Nikkei, the world’s highest circulation financial newspaper, and the Tokyo Shimbun, one of Japan’s most respected quality newspapers, attended the workshop and toured the College. They visited labs, met Imperial academics and some of the College’s 75 Japanese students. They also interviewed Professors Stirling and Mishima about the two universities’ collaborations and aspirations. When asked about Imperial’s position in the world top ten of major university rankings, Professor Stirling said “The secret of our success is that we’re a global institution”. The guests toured the Hydrodynamics laboratory, based in the Department of Civil and Environmental Engineering. The lab consists of state-of-the-art wave tank facilities, covering a floor area of some 3,000 square metres. Dr Marios Christou simulated conditions in the ocean, creating different wave formations and wind conditions for the visitors. The Imperial researcher also showed a device for creating tsunamis in a wave tank, which was of special interest to the journalists. n another demonstration, Dr Henry Burridge demonstrated how these tanks could be used to model airflow. In particular, they were using fluids to model how smoke travels through buildings, which could have applications for improving airflow in houses in developing countries where open fires are common. By using a coloured brine solution, which is heavier than the tank water it travels through, Dr Burridge was able to simulate how the solution travelled through rooms in a similar way to smoke. Professor Guang-Zhong Yang, who leads the Hamlyn Centre, spoke about the latest robotic technologies that he and his team are developing to reshape the future of healthcare for both developing and developed countries. Professor Yang and his team are working closely with academic institutions and industry in Japan to develop robotics that is smaller than the width of a human hair. In the near future, these devices will be inserted into the body to deliver treatments to targeted zones, which could improve outcomes and recovery times for patients. Britain’s separation from mainland Europe is believed to be the result of spill over from a proglacial lake – a type of lake formed in front of an ice sheet – in the North Sea, but this has remained unproven. Now, researchers from Imperial College London and their colleagues from institutes in Europe show that the opening of the Dover Strait in the English Channel occurred in two episodes, where an initial lake spill over was followed by catastrophic flooding. Imperial’s contribution to the Solar Orbiter mission, which will go closer to the Sun than anything so far, is ready to fly after extensive testing. Solar Orbiter is a European Space Agency mission carrying ten instruments to measure many different properties of the Sun and interplanetary space. Aboard the spacecraft, launching in early 2019, will be a magnetometer instrument built by a team from the Department of Physics at Imperial. The magnetometer will measure the Sun’s magnetic field in interplanetary space, carried by the solar wind. The solar wind is a stream of charged particles coming off the Sun that fills the Solar System, which the Sun’s magnetic field plays an important role in creating. Principal Investigator Professor Tim Horbury from the Department of Physics at Imperial said: “We live inside a bubble blown by the Sun in interstellar space. The Earth also has its own magnetic field, which creates a cavity in the solar bubble. The Sun’s magnetic field is thought to be generated in a similar way to the Earth’s as it rotates, but it is much more dynamic. Every 11 years the polarity reverses, and this pattern is tied to the pattern of sunspots that appear on the Sun’s surface. Sunspots are associated extreme events called solar flares and ejections of the solar material that cause serious problems if they reach Earth. By orbiting the Sun and approaching it at a distance of only 50 million kilometres – inside the orbit of Mercury, the closest planet to the Sun – the Imperial team’s magnetometer will be able to get unprecedented information about how the Sun generates its magnetic field and how this plays a role in the solar wind and more extreme events. The instrument is made up of two sensors hosted within metal domes; a black box containing electronics, a computer processor and a power supply; and cables to provide power and communications to the sensors. The magnetometer has to be extremely sensitive to detect the magnetic field from the Sun that will reach the spacecraft. Lead engineer Helen O’Brien from the Department of Physics said: “Our instrument is so sensitive, it could measure the magnetic field of an MRI machine from the other side of London. The magnetometer also has to survive some extreme conditions, including the intense vibration from the take-off, which will use a NASA Atlas V rocket. An earlier model of the instrument, which was put through rigorous tests designed to exceed the expected conditions, crumbled under the strain. Thickening the material helped to solve the problem, and as a result of rigorous testing many tweaks and improvements have been made to the design. But now, the device is finished, and it is waiting in a clean room at Imperial before it gets mounted onto the spacecraft. In the meantime, the team are building a ‘flight spare’ – an identical device just in case something happens to the original before launch. When the instrument is mounted on the spacecraft, the team will be giving extremely precise instructions – down to the material the screwdriver is made out of, and making sure no tiny shavings of metal are left behind, which could disturb the measurements. Once all the instruments are mounted, the whole spacecraft will go through another barrage of tests, before being shipped to Cape Canaveral for launch in February 2019. It will then spend two years getting to the Sun, and another eight collecting data. Eventually, its solar panels will degrade and stop producing power but it will drift around the Sun forever.